In December, Phaneesh Murthy went on a holiday to Hawaii. It was an opportunity not just for a soul recharge, but also to conquer a long-standing fear of heights. So there he was trying to jump off a 35-foot cliff. As he approached the edge he found himself scared to death. “Everyone was screaming ‘jump, jump’ but I couldn’t do it,” he says. For a while, he stood frozen. And then a moment arrived when he chewed up his fear and just jumped. “The willingness to take that plunge was higher than my fear,” says Murthy. In his professional life, Murthy is yet to make a landing after his career leapt off a cliff in 2002. This was after he had to leave Infosys unceremoniously, bearing the unpleasant charge of sexual harassment. Many thought Murthy was finished. But soon, he got his second chance. Sunil Wadhwani and Ashok Trivedi, founders and 46 percent owners of iGate, a software firm that was bleeding after the dotcom bust, asked him to come in as CEO and revive it. Murthy promised a few things. He would take the operating profit margins of the company from negative territory to 20 percent. Similarly, he would boost the return on equity, and help increase the market capitalisation to a billion dollars (for which he was promised a Lamborghini). True to his word, Murthy achieved all the three within seven years. With the company, his career has also turned around. The one pending item on Murthy’s agenda, however, was raising the turnover of iGate to $1 billion by 2010 as he had promised the founders. He had been trying to figure a way to do this for a while. When the Satyam scandal broke, iGate was one of the companies that showed an initial interest to acquire the beleaguered company. But Murthy decided against bidding because of a lack of clarity on financial risks and also iGate’s paucity of funds. Keane, another potential target, ended up in the hands of NTT last year. Murthy has known for a while that size matters in this industry. No matter how hard he tries, there is only so much charisma that can be attributed to the CEO of a $300 million company. So, few were surprised when iGate acquired a 63 percent stake in Patni Computers, by paying $921 million to its four promoters. An open offer to the public shareholders of Patni for another 20 percent stake will take the total cost of the acquisition to $1.2 billion. 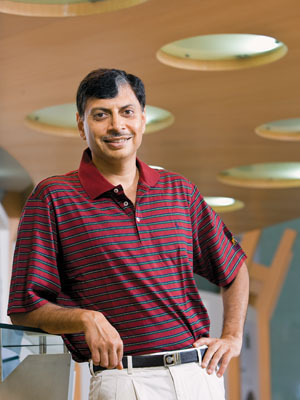 With revenues of close to a billion dollars ($940 million annualised as of September 30, 2010) and a total workforce of 25,000, the iGate-Patni combine will become the country’s tenth largest IT services operation by size. To finance the deal, iGate will take on debt of $750 million but with the combined operating cash flow of about $185 million per year, debt servicing should not be an issue. Yet, there are people who scoff at what Murthy has done. His critics think he has just bought himself some revenues through a ‘financial engineering deal’ and that Murthy is doing this to create a larger balance sheet and drive up the market cap. But what’s with the billion dollar size? “The biggest risk was in staying where we were,” says Ashok Trivedi, co-chairman. “The industry is sceptical about mid-sized players. As a smaller player, we are prevented from running certain races. A billion dollars will qualify us for the larger deals” he says. Trivedi is right. Today the only Indian IT services companies that are globally competitive are the large companies: Tata Consultancy, Infosys, Cognizant, HCL and Wipro. Everyone else is struggling. Specialist companies like Sasken or Aztec have found that their focussed approach hasn’t yet yielded results and the small companies like Mastek and Polaris are finding it tough going. One key reason is that big US companies are now handing out big contracts. These contracts are worth $50 million to $100 million a year in revenue for the IT services companies. But there’s a catch. The US companies don’t want the revenue from their contracts to be more than 10 percent of a service provider’s overall revenue. There are exceptions, but this is typically their way of reducing risk. So if iGate wants to aim for $100 million-a-year deals, it needs a billion dollars in revenues, which is exactly what the Patni acquisition gives. And why does a company need those large $100-million deals? What is wrong with ten $10 million deals? Large deals give the benefits of lower selling costs, more efficient hiring, better space planning and a much higher ability to manage profitability. “Those financial institutions [that] loved our model still gave us niche work to do but believed that we were small to take up enterprise size work,” says Murthy. That’s why he wanted heft. Murthy contends that when a large company talks about a trend or a new service, clients believe it because large companies are expected to be a better harbinger of the future. “Therefore, faster adoption of a newer service model in our opinion will happen because you now have the credibility of scale and size,” says Murthy. Now that Murthy has got his bully pulpit of (almost) a billion dollars, does he also have a message? Murthy says it is outcome-based pricing. Eight years ago he created a model for linking revenues to outcomes. US companies increasingly want to pay for results and not just efforts, which has been the case in the past. And to play in this case you need to have excellent processes or financial strength because cost overruns are not financed by the clients. To make matters tricky, if the outcome is not satisfactory, the IT vendor might even have to pay a penalty. Is it a risky strategy? Yes, it is. Unfortunately, the days of growing a company organically through old time-and-materials contracts are now almost over. In the last 10 years, except for Cognizant (technically not an Indian company), no other Indian IT company has newly reached a billion dollars in size. That tells you something about the difficulty of the task. So Murthy has to try something different. He reckons that if he positions iGate-Patni as a result-focussed company, he can stand out from tens of other companies that are selling their technical skills rather than solutions. “Yes, that’s certainly the bet. The brand of business outcomes will take us faster onto growth trajectory,” he says. Truth be told, a BPO company like Genpact or WNS would have been better for this strategy and not Patni. But a proposal from Mark Dzialga, managing director of General Atlantic Partners, the private equity fund that held 17.4 percent in Patni, changed that. Dzialga told Murthy he would back iGate to buy out the founders’ stake in Patni. At first, the idea didn’t appeal to Murthy because he felt that Patni was a me-too brand. But as he took a closer look at the company, he realised that it had some good accounts with stable revenues and revenue segments such as insurance and manufacturing that were complementary to iGate’s business. Trivedi, Wadhwani and Murthy also believe that Patni is at the same stage where iGate was before Murthy came in — frequent change of leadership, high attrition, low margins, and slow growth. If Murthy can turn around iGate, he could do the same at Patni too. Murthy had travelled to Mumbai in December for his first meeting with the Patni brothers and CEO Jeya Kumar. He found out that Patni employees were not in favour of getting acquired by a pure PE consortium. “The ‘for sale’ must go down for the company to progress and for that a sale needs to occur and although the Patni brand will disappear in time, a merger with iGate would be a good proposition for the company,” says Jeya Kumar. His second challenge will be to pick people from the leadership teams of iGate and Patni to go out and sell the outcome-based model to the world. And Patni doesn’t have too many leaders who can do that. Murthy would obviously want to reduce costs. Salaries at Patni are higher than those at iGate and CEO Jeya Kumar reportedly has a $20-million severance package. “I like the guy but we have to see how we fit him in; his salary is much higher than anyone here. We have to see what role to give him,” says Murthy. Murthy is totally focussed on operating margin and whoever cannot justify that value will have to go. But he will have to tread with care where cost-cutting is concerned. “We will not do the GE style of surgical operation that we just go in and rebadge everyone and downsize the operations. Every person who leaves will take 10 more people with him and without us assessing them and them assessing us. We will do this slowly and carefully,” says Sircar. The stakes are high for Murthy but his board is backing him totally. “There are two kinds of CEOs, those who understand the big picture and others who are good with details. Phaneesh is one of the rare few who can combine both,” says Sunil Wadhwani, co-chairman of iGate. That raises a very important question about the future of both companies. Does Murthy have a strong second-tier leadership team that will now help him integrate the operations and take both the companies to the next level? “Leaders need not come only from iGate. Patni has a strong leadership bench too who just need the right direction and strategy,” says Murthy. Finding those leaders is going to take up much of his time. iGate has enlisted Hewiit Consulting to understand individual roles and draw up a roadmap for integrating the two teams. 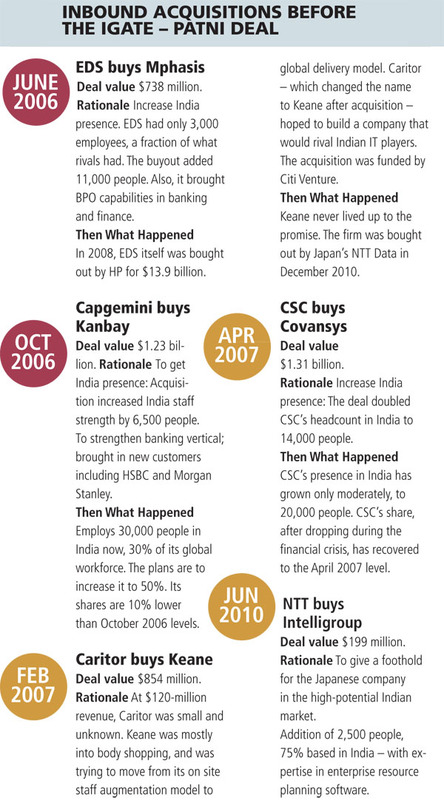 iGate\'s takeover of Patni was a stunner. How will things pan out now that Mr. Murthy is out of iGate-Patni? This is an achievement for Phanish & IGate. This shows his capabilities and thinking towards taking such risks from growth perspective in bidding for larger deals.